This coming Saturday, 26 May sees Pinotage on Tap (POT) festival held near Brighton, the first ever POT staged outside South Africa. Update: Sunday's POT has been cancelled. The event will now be on one day only -- Saturday 26 May. See you there. POT, hosted by Diemersfontein Wines to celebrate the new vintage of their famous coffee'n'chocolate Pinotage, regularly attracts thousands of fans to the wine farm in Wellington, South Africa and in recent times POTs have also been held in Johannesburg and Durban. The location is Poyning Grange Farm, Fulking, South Downs, Sussex, near Brighton. Nearest rail station is Hassocks on the First Capital Connect ThamesLink line from London and Bedford. Shuttle busses from Hassocks station to the festival have been arranged and seats can be booked via Diemersfonteins web site. Tickets to the festival cost £65.00 per person. I was talking to a South African couple at a tasting last night and they went all misty eyed at the list of music performers, they had fond memories of listening to musician Robin Auld back home. Also playing are Londesome Dave Ferguson and Albert Frost. Diemersfontein say the festival will involve a variety of culinary treats, from various bowl foods and canapés, to the much spoken about "strawberry and chocolate fountains". Wine lovers can enjoy a fantastic day out, whilst sipping this delectable wine, eating a variety of interesting foods, playing games and listening to great live band music. Promising to be an authentic South African party in every possible way, with typical South African cuisine and entertainment by South African musicians. 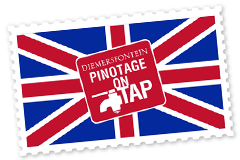 And of course, Diemersfonteins original Coffee Chocolate Pinotage will be flowing from the barrel, literally "Pinotage on Tap"
More information about the event can be found on the Pinotage on Tap 2012 page, as well as Facebook and Twitter.